Shop Baby SuperMarket online at BabySuperMarket.com for the very best baby furniture, bedding, car seats, strollers and much more. 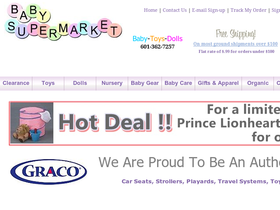 BabySuperMarket.com also carries a huge selection of toys, collectible dolls and play dolls. Visit BabySuperMarket.com to learn more about their great products. Don't forget to visit 58coupons.com for the best BabySuperMarket.com coupons, BabySuperMarket.com deals and BabySuperMarket.com promotions. Right now you can save $10 on BabySteps Complete Natural Feeding System from BabySuperMarket.com with this coupon code. Click on coupons to view and print. Now if you spend over $100 at BabySuperMarket.com you will be eligible for free shipping. Click link to begin. Hurry on over to Baby SuperMarket to save on Medela breastfeeding products with code. Click link to go there now. Don't miss great savings on clearance items at BabySuperMarket.com. Click link. Right now you can save up to 25% on select strollers at BabySuperMarket.com. Click link to begin.